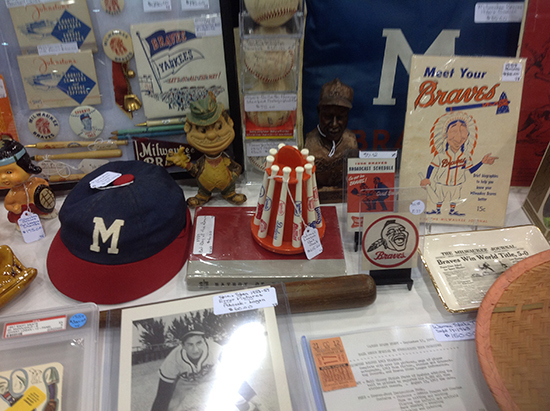 GuideWhether you are a grizzled veteran or a rookie call-up making their first appearance at the big show, attending the National Sports Collectors Convention is like Disneyland for collectors. The scale of the show itself is massive given the long duration, large number of dealers and corporate partners, and the square footage of the exhibit space. These combine to mean one very important thing for collectors: you better come with a game plan. 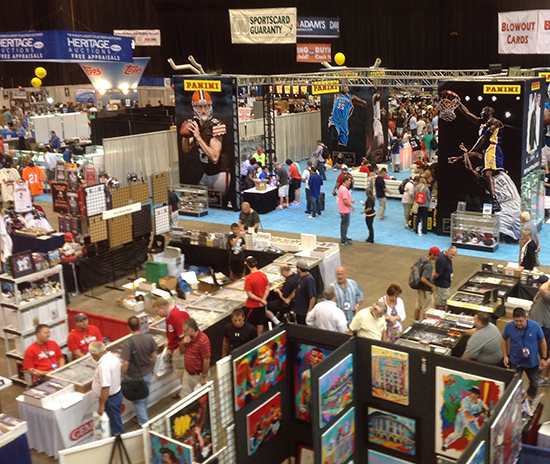 In addition to checking out our guide to the 2019 NSCC, here are some things to consider when making your plans for attending the National. Are you attempting to complete sets? Add to your player or team collection? Are you looking to purchase new wax? Are you planning to take advantage of manufacturer promotions like wrapper redemptions? Is your intent to purchase from one of the auctions or to consign your items? Are you submitting cards for grading? Is your focus to get your items autographed and take advantage of photo opportunities? Having an answer to these questions before you get to the show will save you both time and money. Cash: Larger wax retailers and dealers will take plastic but most dealers work strictly on a cash-only basis. Remember to stick to your budget. Backpack or Small Roll-Behind Suitcase: You will want a hands-free way to stash and carry your plunder. Want List(s): It's easy to get overwhelmed by the amount of material available to you. Stay focused and remember to check off your list so you don't mistakenly buy duplicates. Good Walking Shoes: This can't be stressed enough. It may seem rudimentary but you're going to be doing a lot of walking, bending over tables, and standing in lines. Bottles of Water: Staying hydrated, even while indoors, is key. 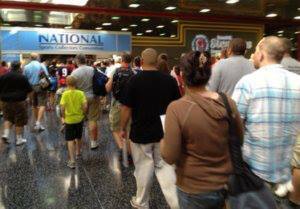 Who wants to take time away from the show floor to wait in line for a $3.00 bottle of water? A couple of bottles of water will go a long way. Autograph Items: If you're purchasing tickets for guests at the Autograph Pavilion, it's a good idea to get photos, balls and other items to be signed before the show and bring them with you. Dealers at the event will likely charge more at the event. Bringing the particular pen or Sharpie you want the item signed with is also wise. Cards for Grading: All the top grading companies attend The National and will be taking submissions. Most offer a show discount of some kind. Consignment Items and Vintage Cards for Sale: If you have a piece of game-used piece equipment or a stack of near-mint vintage cards that you're looking to part with for quick cash to spend on the show floor, only bring your good stuff. Dealers don't want your junk. Remember, they're buying it to make a profit so be flexible in your negotiations or just walk-away if you feel you're getting unrealistically low-balled. No one has a gun to your head to sell your items. Storage Items: Chances are that you have these at home anyway, so bring some. Different sized top loaders, penny sleeves, team bags, and snap tights or magnetic holders should all be brought for any freebies and pack pulls. It will save you money and you won't have to waste precious time hunting them down. Don't expect dealers to have any. Gum or Mints: No one wants to be that collector. Miscellaneous: It can also be ideal to have pen, paper and a camera handy. Collapsible Chair with Sleeve and Shoulder Strap: If you're looking to buy singles to fill sets, this is something to strongly consider. Dealers have to pay for chairs and most will not have extra ones available for patrons. A few hours of leaning over 5,000-count boxes, coupled with all the walking, will wipe out your back by the end of the first day. Sack Lunch: Convention center food is expensive and bland and the lines can be long. Would you rather spend an extra $12-$15 a day on cards or on a mediocre sandwich and bag of chips that also takes away from your time? Junk Wax: Nobody wants it and you'll be stuck lugging it around or wasting time returning it to your car. Commons: For the most part, no dealers will be buying 5,000-count boxes of base cards. When you do see these transactions taking place, they have usually been brokered ahead of time, most likely in response to an online or print ad. Off-Condition Vintage Cards: Condition is everything to vintage dealers and chances are they will pass on all sub-par conditioned items. Unless you've got some of the most iconic cards ever made, don't bother bringing anything that would grade less than VG/EX. Large Luggage: You don't want to be the guy people have to navigate around with your monstrous roll-behind. It happens every year. After you put your initial game plan together, be sure to visit The National's official website for up-to-the-minute additions and changes to the show schedule and planned events. Here is a brief rundown of some of the regular opportunities available to collectors. VIP Party: This is the official kickoff event of the Annual NSCC (VIP or Super VIP badge holders only). Sneak Peek Event: The official grand opening of the NSCC open to all patrons takes place on Wednesday from 4:00 PM to 8:00 PM. Kids Free Week at the National: All youngsters 12 and under will be admitted free all five days of the show, courtesy of the National. Don't jump on the first card you see that is on your list. Chances are you will find it eight tables down for less money. Instead, make a note of the item and booth number and circle back. Don't be afraid to counter-offer the marked price of an item. Dealers are used it and the worst that can happen is they decline. Unless you're a high-roller with deep pockets or like overpaying for cards, don't even bother with dealers who do not have their items clearly marked. You will most likely waste your time asking. Deals can be made fast and furious in the latter hours of the NSCC on Sunday as it is the final day. Dealers are looking to show a profit from the cost of exhibiting and are often willing to wheel and deal more than usual. If you have autograph tickets, head to the autograph pavilion about 30 minutes before your scheduled signer is set to appear. The event organizers line you up according to the number on your ticket so it isn't a free-for-all. You would hate to miss your spot and have to wait in line at the back of the queue. To get the most out of the National, dress comfortably, have a game plan and stick to your budget. Most importantly, have fun! That's why you collect in the first place, right? Thanks for creating this guide! I haven’t been to the National but it’s something I hope to attend one day in the near future and these tips come in quite handy. I really want to go and this does help but i cant because im going to be trying out for scouts of the kansas city royals so it is not that bad at all and i hope it is as good as it sounds for everyone who is going. happy hunting! Tim Simms (ID 24656) � Congrats Tim! Let us know how it goes and GOOD LUCK. We will be sure to cover the event closely so that you and everyone else who couldn’t make it will still be able to stay up to date on what happens here. Well just got back from the try out wasnt to bad the rain stopped it early but I did impress so I got another one Aug.27th should be fun. Tim Simms (ID 24841) � Congrats, Tim! Best of luck in the weeks ahead. Tim Simms (ID 24841) � Awesome, keep us posted. As a very longtime collector and show attendee, I still found some useful suggestions. For more recent collectors, your suggestions are superb. I notice that much of your page is sponsored by PWCC. I have both bought from and submitted material to them. I sincerely have found them to be the best company in the trade to deal with.